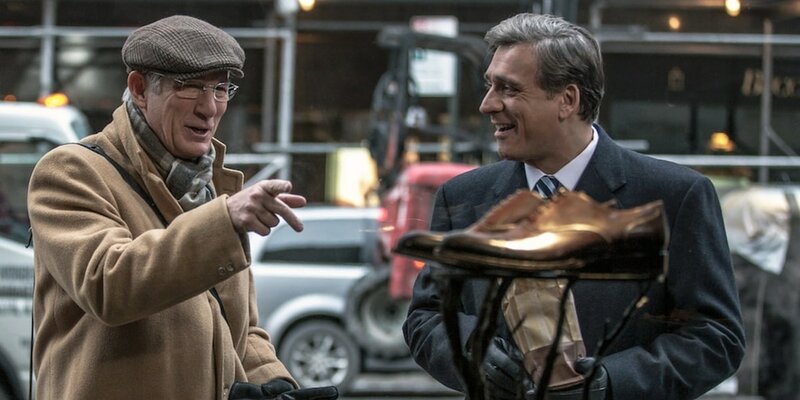 ​"Norman: THE MODERATE RISE & TRAGIC FALL OF A NEW YORK FIXER"
THE STORY - Norman (Richard Gere), a New York fixer, knows the right people and can get things done. When an Israeli dignitary named Eshel (Lior Ashkenazi) comes to the city, Norman decides to impress the man by buying him some very expensive shoes. It works and he establishes a strong connection to the man, but a few years later, when Eshel becomes the Israel prime minister, Norman can't communicate with him anymore, and this threatens to destroy his reputation. ​​Have you ever had that one person in your life that you just can't say no to? How about that one person who simply won't say no to you? Not being able to say the word "no" can be a very dangerous thing as seen in the film "Norman: The Moderate Rise And Tragic Fall Of A New York Fixer." That's quite the mouthful so for the rest of this review we will simply refer to the title of this film by "Norman." Richard Gere gives an obsessive performance as the title character but it's really Lior Ashkenazi who runs away with the film in what equals out to be a heartbreaking performance. Norman Oppenheimer (Richard Gere) is a unique businessman whose specialty is getting people to connect with one another in attempts at doing good in the world. We never see his office, his home or any aspects of his personal life. Norman is consumed by his work, trying constantly to broker deals and make connections. By chance, he meets Micha Eshel (Lior Ashkenazi) who is an Israeli politician and ends up buying him an expensive pair of shoes one afternoon in New York and thus his friendship. Years later, Eshel is now the Prime Minister of Israel and when Norman enters back into his life, he attempts to use his friendship with the Prime Minister for his community but mostly his own benefit. Richard Gere portrays Norman Oppenheimer as a hustler of the highest order. With a past shrouded in mystery and a current day existence which we also don't know much about, Gere has to convey exactly who this character is by his actions and behavior. Norman is an interesting character in that he is obsessive but also wants to do good for his community and by extension, himself. The film brilliantly explores this selfishness through the eyes of Norman and Prime Minister Micha Eshel. While Norman seems to be doing good for those around him, we all know that his end game is to better position himself within society. Eshel, on the other hand, is trying to do good for his people even at a point when it comes to risk his friendship with Norman. Joseph Cedar really dives deep into how actions can make a man whole or can lead to his downfall. We all know based on the title that Oppenheimer is a ticking time bomb (Is it a coincidence that he shares the same last name as Robert Oppenheimer, the man who created the atomic bomb? ), but it's still fascinating to see his rise and fall as Cedar examines this character and his behavior thoroughly. Contrasted against the character of Eshel, "Norman" makes for one introspective commentary on the morals of man. If there are some criticisms to be made, Joseph Cedar, for all he does right with his screenplay and the performances he gets out of his actors, tries a little too hard in attempting to give this film some cinematic moments. Awkward uses of split screen, an unexpected moment where everyone around Norman freezes in place while he walks around them and a never-ending montage of talking heads fading in and out across the screen are all moments which take you out of the movie and wish that Cedar would just get back to his brilliant character study. It's absolutely riveting to see a man spiral out of control due to his eagerness and empty promises. Lies get stacked upon lies as a desperate man tries so hard to make a name for himself in a world that could care less about him. However, there is always one individual who cares and it's the unlikeliest person of all. The bond between Norman and Eshel is the heart of the movie and really helps drive home what a tragedy the rise and fall of Norman Oppenheimer really is. Despite some criticisms, this is one fascinating character study which I recommend.